White House officials have announced Tuesday that Vice President Mike Pence will attend the Winter Olympics in South Korea in early February, with an eye seemingly toward ensuring that North Korea’s attendance of the event doesn’t lead to improved relations. Bilateral talks between North and South Korea have improved relations in recent weeks, and a big part of that is their agreement on the Olympics. The US clearly has problems with this improved relations between the two, and has gone to great lengths to present North Korea as somehow trying to trick everybody in being willing to negotiate. The hope appears to be that Pence can undermine this actual goodwill, though exactly how he manages to do this without making the US look like an obvious and literal spoilsport remains to be seen. North Korea has been very public about wanting to reduce tensions, but they’ve also been very public about their nuclear arsenal being aimed at deterring a US attack, and CIA Director Mike Pompeo once again said he doesn’t believe that is the case, despite a number of top US officials, including Pompeo, advocating US military intervention against North Korea, and imposing regime change. … OK, so Pence is going to do what exactly to upstage North Korea? Skate in a tutu? This sounds more like — since we cannot boycot Olympics, VP will have to show up there, with his head high. Unfortunatelly, this is VP job, in addition to attending funerals. Funerals huh? Not his hopefully; he’s not that dislikeable. Such an incident blamed on NK would certainly put an end to rapprochement talks with the South. The man is a full-blown, raging Dominionist and to have him this close to the WH should scare the bejeezus out of most of the world. I have no problems with Christians but this man and those like him would/will do whatever it takes to force a way of life on the American people most do not want. And if it means leveling a country or two, they’re only shitthole countries. As long as it’s only shitthole countries……..
What about shithole parts of countries that are crime infested wastelands of non-productivity, welfare dependantcy & abject abandonment? You’re 100% right on this, MvGuy; what about shithole parts of countries that are crime infested wastelands of non-productivity, welfare dependency and abject abandonment, devoid of Christian pretensions? I agree; perhaps, Mike could get himself back to Christian basics, such as the Golden Rule, and stay away from murky political intrigues .. And, even try to emulate the “Prince of Peace” whom he claims to follow and revere. To do otherwise only gets him to blunder into hypocrisy and evil words and deeds. Those who follow the Dominionist sect founded by Schofield are NOT real Christians, since they don’t follow the teachings of Jesus Christ; they’re apostates. There’s no rapture; everyone still living when TSHTF will suffer in one way or another. Zionism isn’t Christianity, it’s an ideology totally opposite of Christianity. If Pence belongs to John Hagee’s sect and proclaims to be a Zionist, he’s NOT a Christian; period. Well, he’s not your kind of Christian. Mine either. But Christian is a pretty broad descriptor and has been ever since Paul paganized and polytheized the brand of Judaism taught by Jesus. 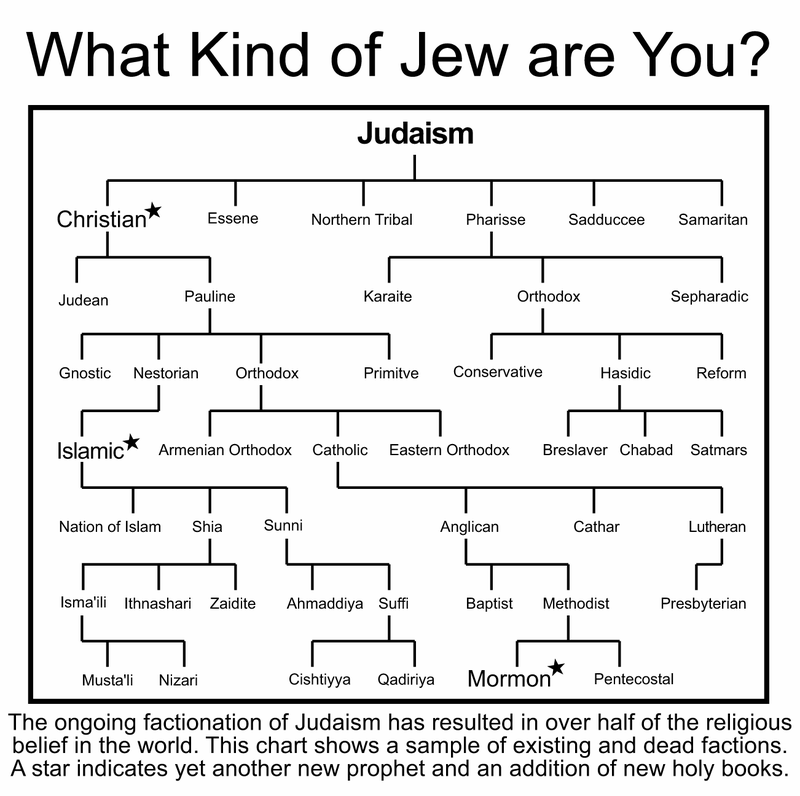 My favorite religious tree chart. It is worth checking out Naomi Klein’s articles on Pence’s behavior after Hurricane Katrina. He is one of the cruelest, meanest types possible, and his job at that time allowed his depradations on the people of New Orleans. Ahem; worthy of – assassination – and the domestic and geopolitical turmoil that would follow? Especially in this case if its blamed on NK? You seem to be a literate soul so I’m surprised that you would pull something out of what I said that was not there and most surely, not intended. There are other means to get things done without resorting to the kind of machinations you state. Oh, sorry. My comment to Bianca was, I thought, clearly stating Pence wasn’t dislikeable enough to start a war over his untimely demise, with the two conditions clearly linked. Your comment on second reading clearly interprets the first condition – he wasn’t dislikeable enough – without linking to the second. Her mention of funerals made me recall that neocons not only dwell on doing the unthinkable for advantage, they enact it. Pence might be flattered to be a trigger WWIV in any case, except for the part where he isn’t around to be flattered. Not to belabor this point, I think she was referring to one of the three primary functions of the VP…that being going to state funerals overseas…the other 2 being casting a tie-breaking vote in the Senate and lastly, keeping his/her mouth shut and staying out of the headlines. I don’t think, in this case, she was referring to the possibility of an untimely death of the NK dictator. I was referring to Pense’s untimely demise on an off-the-cuff take on her funeral remark. Its not likely Kim wold be assassinated because there’s no real gain; the NK leadership is more than one man. He’s not a key rocket scientist or general. Sure he is. If he died tomorrow, I’d be happy. Not if its in a way that serves as a pretext for violence up to and including war in Korea. Of course not. Also,I only said that in jest. Did you read that NSA? It was in jest, I swear to allah. Oh wait…. Mike can take the salute – whoever’s ‘snapping’ one. Pence ain’t worth the fallout. Running into so many inconsistencies — that it is hard to keep this (or any) story straight. I frankly don’t believe the administration has any idea of what they are doing or why for that mater. N. Korea is going to attend in concert with S Korea and that is hard to spin for Trumps propagandists. Its not like Pence can preach to these folks, maybe he will stand up and walk out in protest? Can you imagine the false-flag scenarios that are being kicked around Langley this morning? And I thought that Trump was stupid! Can Pence possibly believe that North Korea is “hijacking” the Winter Olympics? He is certainly a lousy example of what religion can do to your brain. Loving some racist land-stealing country like Israel is bad enough, but to continue to provoke a newly nuclear-armed North Korea into lashing out against us puts you deep in Yahoo land. Actually he’s a perfect example of what religion can do to your brain. A lousy example would be someone who is a normal thinking human being. I have generally found religion to to benign, often a positive force even…..trouble comes when it acquires the power of the state. I find it to be an evil polarizing fairy tale. The problem with the racist, land stealing protege of ours, is that it genuinely hates Christianity. in all its history books it describes the rule of Christians iver Jerusalem as the most oppresive. The end of Christian rule and subjugation if Jerusalem to Islam is described as the end of repression. Wikipeadia is as good a source as any. Until today, the rise of Islamic cults that are devastating remaining Christians in Syria and Iraq, were widely welcomed by Israel. In fact, they preferred black ISIS flag over Damascus, to the tolerant, secular rule of Assad. Israel has never hidden its hate of Christianity, and never expressed outrage over cruelty committed against Christians in Syria. The great Christian Pence, is comfortable with that. In fact, too many Christians are very comfortable with the outright contempt for its rights iver East Jerusalem. Christian heretage there has been abandoned, Christians almost entirely removed from fhe old town, with more to follow. It was King Hussein of Jordan that reminded our leaders that he has been entrusted with guardianship of religious shrines of Old Jerusalem – and that includes Christian shrines. Message — if you do not care, why should I. Pence, like all of the Israel supporters, hardly know either the history of Christianity, the sicial changes it brought, its ethics and morality, soul and spirituality. They know little of the abuse of Christianity by Christian rulers and Emperors. But the Christianity has left a mark on population, regardless of the behaviour of ruling casts. It is the strong sense of justice and injustice, as the soul has not been erradicated yet. Not that work is not in progress as we speak. One can just liik at Disney priduction for kids, and the amount of “funny” incidents of little cruelties, elite supremacy, mean spirited behaviour, one is subjected to. Message to kids — being good is being stupid. Midern morality and ethics is not Christian, no matter the pious expressions and fake sentimentality. The moment a cruelty is called for, all the Christian sense if justice is to be redefined — ehere victim becomes villsin and the totmentor — a victim. This pricess of demonization of our targets is the only concession to Christianity morality theater. Christianity is after all responsible for Holocaust, and thus, it is being reformed. Pence is a good example of the product. Why doesn’t he go stick his head in an oven! Warmonger. piece of….. “oven”??? Well isn’t that statement in poor taste, to say the least. Allies are the greatest force multiplier. When they see how crazy the Trump Administration is they’ll be headed for the hills. Stupid is good. The end of the ZioAmerican Empire is at hand. Watch out! The worst could in fact happen. Peace. No problem, though. Pence to the rescue. He’ll smash the legs of a North Korean figure skater and that threat to the America’s well being, Peace, will be gone in a Maralago minute. To think differently would be thought crime. Thorstein, long time since I’ve seen you comment. Should I say welcome back, or work on my memory and browsing discernment…??? What is Li’l Kim is coming south? Egad! OMG…. ???? “with an eye seemingly toward ensuring that North Korea’s attendance of the event doesn’t lead to improved relations”. WTF…. First off….???? Good Relatioms with whom does Dumbo Pence wish to insert himself to prevent…??? Gee maybe HE can make these Olympics lead to WORSE relations with South Korea, North Korea…. Wow, if he is really lucky maybe he can even make relations WORSE with China and Russia too, even goad them to into taking N Korea under their THERMONUCLEAR MIRVed TOP DRAWER ICBM umbrella.. You go Mike…. I guess THAT might dull the Trump ardor to give the N. a bloody nose, and diminish his confrontational rhetoric. Truth, honor, is anything left that is sacred to these bloodthirsty warmongering morons except for their hunger for more suffering, death, and destruction? The Koreans are talking to each other! The horrors! I wish the US morons would just get out of the way of the Korean people working together with China and Russia. Can someone or something put a leash on these US morons? There is no truth and honor in these warmongering idiots, only lust for more suffering, death and destruction. The Koreans – North and South – are talking to each other! That’s the best news I’ve read .. Now, I just wish the US idiots would simply get out of the way of the Korean people working together with China and Russia. The late Gen. Douglas MacArthur warned against fighting a land war in Asia, after having been sacked by Pres. Harry S. Truman .. Both Pres. Trump and VP Pence should seriously read MacArthur’s last speech before Congress, but I doubt the Zionist Pence will even glance at it, much less, read it. What would USA do if Peace broke out across the whole world? China would do fine, they would trade goods. Russia would keep Europe and China warm with their gas. Africa would sit back and watch the Yams ripen. Pakistan would make friends with Afghanistan and India limiting their aggression to daily displays. The way that wars should be conducted. The only unhappy people would be Israel. Not only does the USA insist on keeping its enemies and ensuring there is no sign of peace, but it treats the “allies” like SH*T, as we see with South Korea, Japan, the EU, any African nation…. Kim is playing the Dotard administration, as well as the rest of the world, beautifully with his Olympic “detente”. Who knows what the real motive is and nobody should trust him, but it is entertaining watching them squirm. Pence’s “attendance” will be roundly ignored; until he says something stupid, again. This would have never happened on Hillary’s watch! She would have nipped this insane talk of peace in the bud before it reached the crisis point we are at now. Well put, but our burgeoning Neo-Facisim isn’t the answer either. Burglars everywhere nod their agreement. Deterrence must be deterred. If not overwhelmed.